ValhallaPlate, Software algorithmic reverb from Valhalla DSP. 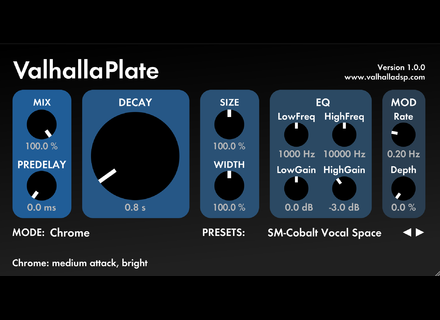 Valhalla DSP has released ValhallaPlate, which unsurprisingly happens to be a... plate reverb plugin. According to Valhalla DSP, ValhallaPlate is true stereo and emulates a steel plate with 2 input drivers and 2 output pickups. It can be run as a mono-in/mono-out, mono-in/stereo-out or stereo-in/stereo-out plugin. High diffusion, for reverbs that have maximally high echo density. Frequency dependent decay time, for huge lows and clear highs, under the control of a single Decay parameter. Dispersion, for creating 3D imaging in the decay. The reverb comes from outside the speakers, and decays into the depths behind the speakers. 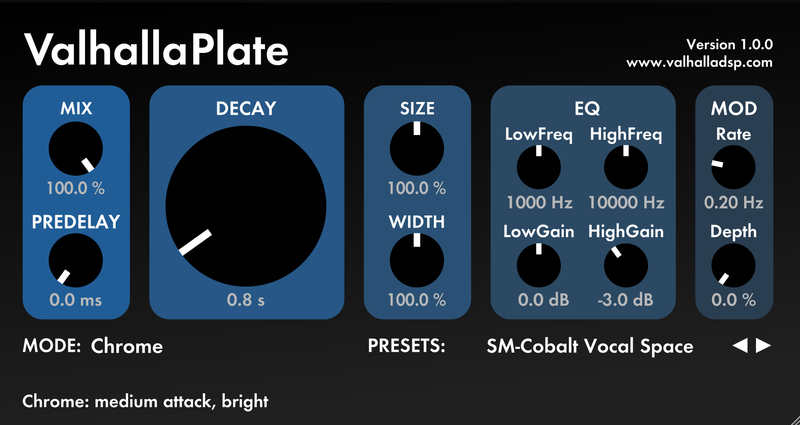 Variable size, to control how metallic a reverb mode sounds. Small sizes result in more metallic delays, while larger sizes sound clearer. Lush modulation, that eliminates any metallic artifacts, while retaining the pitch of the input. Four reverb modes (Chrome, Steel, Brass, Cobalt) that model the resonance density found in real plate reverberators. Three additional reverb modes (Aluminum, Copper, Unobtanium) that combine the 3D dispersive characteristics of steel plates with the high resonance density found in reverberation chambers. ValhallaPlate also builds upon the Valhalla DSP plugin heritage with minimalist, resizable 2D GUI with self-documenting tool tip area, a comprehensive preset browser to make easy saving, recalling and sharing settings. It also is fully compatible with 32 and 64 bit DAWs (32/64 bit VST for OSX and Windows, 32/64 bit Audio Units for OSX, 32-bit RTAS for OSX and Windows, 64-bit AAX for OSX and Windows). MSRP is $50. More details at valhalladsp.com. Special sales at Mystery Islands Music This month, Mystery Island Music offers special sales on its Roland JP-8000 & JP-8080-related soundsets and editor. EastWest announces three new solo instruments EastWest has announced new Hollywood Solo Instruments for Composer Cloud Subscribers: Hollywood Harp, Hollywood Solo Cello and Hollywood Solo Violin. Chocolate Audio Contemporary Vintage Drums Chocolate Audio has released Contemporary Vintage Drums for BFD and Kontakt, currently available at special introductory price.